More on the OFM UtiliStool Computer Stool With Drafting Kit (Blue) 902-DK-133 below. OFM's 902-DK "UtiliStool" is a wonderful solution for labs, drawing rooms, studios and light computer work. Blue stain-resistant fabric (rated at 750,000 double-rubs). 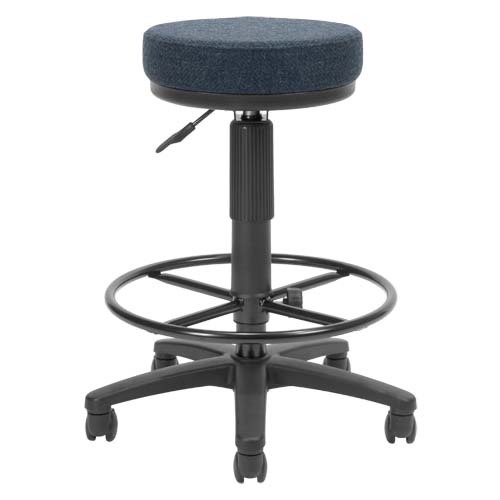 A circular, steel drafting kit/footrest and two extension columns, adding 5-9" of height. A 14"-diameter, 3"-thick padded seat. Dual-track casters, offering easy mobility on hard or carpeted flooring. 5 available colors, designed to match any office decor. Minimal required assembly, allowing for fast and easy set-up. *Also available in anti-bacterial vinyl. See "Related Products" for more information. Seat Height: 23-27 or 27-31"